How to make quality wines from your own grapes grown in your own backyard vineyard. 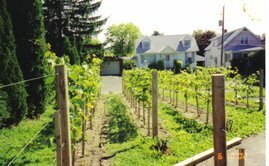 Even in a less than ideal climate, with a little determination and some hard work, you can have your own backyard vineyard and winery. I detailed how I came to plant this obscure winegrape as well as some background information on it. I mentioned that at that time I was hard-pressed to find anything that would help me make an educated decision as to planting it in my vineyard or not. Not much has changed in that regard. Aside from a few bits of information here and there, you just can't find much to go on. After much consideration, I went with my "gut" and ordered the vines. I have been cultivating and making wine with the Regent winegrape now for six years! It's amazing how fast time flies. I just pressed my 5th vintage and it's finishing primary fermentation in glass. Was my "gut" right? I would have to respond with a resounding yes! Let's get this out of the way first, Regent is not a perfect grape. It has some disadvantages. But for me in my cool-climate, USDA hardiness zone 5B, upstate New York vineyard, it has been excellent. It breaks bud later than many hybrids or Vinifera varieties, on average early to mid-May in my climate. Thus, it usually avoids spring frost damage. It is not overly vigorous and is maintains a relatively open canopy with an upright growth habit. That also facilitates VSP training, which I prefer. Regarding winter hardiness; this was one of my biggest concerns when I was deciding whether to plant Regent or not. I have not found much information on the Internet about this subject and I still don't. What I do find says that I should not be able to grow Regent in my climate in most years, ranking it's hardiness with most Vinifera varieties at about 0F to -6F. I believe there just isn't enough experience with the grape in cool to cold climates. That being said, here's what I can now tell you has been my actual experience over the past 6 winters with my 30 Regent vines. Below zero temperatures are an annual occurrence in my vineyard. The question is how low will it go? The potential exists on very rare occasions for winter lows as cold as -20 Fahrenheit. It hasn't happened in the 13 years I have been growing winegrapes. 0 to -10 Fahrenheit is more common. I have however, experienced -13 and -14 Fahrenheit on at least two established and recorded occasions with Regent. Both times Regent survived handily with absolutely no trunk damage. It has however suffered bud damage in both of those years. Those temperatures have reduced my crop by up to 60% in the worst year. I will add though, that in those years of reduced crop, I have had made some of the best wine from my Vineyard with Regent. Regent is a good producer and has consistently attained full maturity for me by the end of September. It has achieved sugar levels of 24 degrees Brix in 3 of the past 5 harvest seasons. The lowest Brix I have seen is 22.5 degrees. As far as acid is concerned, T.A. levels ranging from .4 to .6 are what I have seen. I have not had any PH problems, but you do need to keep an eye on it in very hot years. A few other observations I have noted are that the skin on the grapes is thin and with such nice sugar levels wasps love to bore into the grapes and eat them until they are just empty shells. Traps have helped minimize this for me. Also when the grapes need to hang longer in cooler years, they tend to being to fall off the bunches when very ripe. Not a huge problem, but worth mentioning. It has excellent disease resistance, with only a bit of Black Rot posing a problem in some years for me. All in all it has been very easy to grow in my vineyard. The wines I have made with Regent are very dark, but not inky like many hybrids. It has strong cherry notes, also common of hybrids, but a very good tannin structure. The tannins are on the medium side. My best vintages have had notes of dark fruit, earth and even chocolate. They have been really good. Under-ripe, the grape produces a herbaceous and harsher wine with more of a sour cherry component. Over-ripe, the PH can get out of control and make a flabby wine with a black olive kind of flavor. It's not terrible, but I chose to blend it with a Noiret to balance it out just a bit that year. I'm still really learning how to best handle this grape in the winery, but so far I shoot for a Brix of about 23.5-24, T.A. of .5 and hopefully a PH of less than 3.6. I have tried different yeast strains such as Red Star Pasteur Red, Lalvin 71b-1122 (usually used for whites, but can be used to reduce acid in hybrids) as well as Lalvin Bourgovin RC-212. I have settled on the Lalvin Bourgovin so far. I always do a malolactic fermentation even in years of lower acid because it really adds a nice vanilla and caramel hint as well as a velvety feel to the wine. I would rather have those flavor components and adjust the acidity if I need to, so I feel it's a must do. Regent can handle a lot of oak and I always oak it. I have found it best to avoid toasted oak because it increases the black olive component to an unpleasant level, even when the grapes are not over-ripe. I like to macerate 3-5 days and absolutely no more. Err on the side of less. The less ripe, the fewer days on the skins. But still no more than 5 days even when perfectly ripe. I still don't think I have enough experience with Regent to have really dialed it in yet, but I'm determined to keep working with it until I find the right methodology. Of course, that will differ from vineyard to vineyard, climate to climate, and with personal taste. I am really pleased with where I'm headed with it though, and I feel the best has yet to come. A neighbor of mine who is an Italian immigrant, has also planted Regent after seeing my vines. He leans toward a more "traditional Italian" technique with natural fermentation, less emphasis on science, and even mixing grape varieties. However, he made a 50/50 blend of Regent which he grew, and Merlot grapes that he purchased from California. The resulting wine won 1st place at a local wine competition held at an Italian community center in 2014. It beat the 100% Merlot wine he also made that year from the same California grapes. I'm not sure what that means to those of us interested in growing and producing quality varietal wines, but I think it's a testament to Regent's potential and quality. I can't help but wonder what Orson Welles might say if he were around to taste what I consider to be my best Regent vintage to date, from 2012? I'm not sure, but hopefully it would be something along the lines of; "It's almost time, You're getting there". But than again I've never tried Paul Masson wine. It seems like just a mass produced bulk wine. Was it even any good? I guess it's all a matter of personal opinion and taste. Hi David, thanks for the update. I have a similar story to yours. I live in Omaha, NE, which is in zone5a. I decided to grow grapes and make wine probably 10 years ago. I ended up choosing to grow Frontenac vines... A mistake. They grew out of control. I tried everything to reign them in. I also planted a single Chardonel vine at the same time, and it grows perfectly. So, I had some kind of comparison. I decided I hated the Frontenac and wanted something else. I finally settled on Regent, which I purchased from Red Dog Vines in Ankeny, IA. So far they are perfectly resistant to the cold, and make nice small clusters. It is a superior vine to Frontenac. Keep up the updates for us! Hi David, this was a very helpful write-up... thank you! We have 50 Regent vines planted in NW washington and will attempt our first wine from these grapes this fall. Hey David, we harvested last Saturday and all went well! Our numbers were 1.090 S.G. (21.5 brix) and 5.0 T.A. Found out that my narrow band pH strips were pretty much worthless, but maybe 3.8 or so? I brought the sugar up to 1.100 and added some acid to bring the T.A. up to 6.5 or so... assuming the pH went down with that addition but really need a digital meter! Followed your advice using RC-212 yeast. I am in my 5th day of maceration/primary fermentation, sugars have dropped to 1.050 or so. You say to press no later than 5 days... is that even if it's not converted all the sugars to alcohol? Oh yes, and I forgot to ask. Are you oaking in primary fermentation? Secondary? Bulk aging? Or, possibly a combination of these periods? Also, do you prefer American or French oak? Hey Mattster, Awesome and congrats on your first vintage! How many gallons of must did you get? Yes press and the fermentation will continue in your secondary fermenters, ie; carboys or demijons, etc. Those grapes are just a smidge underripe so it's good to get them off the skins sooner rather than later. The RC-212 will help soften, although you TA looks great! I would still do a malolactic fermentation though. I do not oak until fermentation is complete and the wine has been racked twice. So during bulk aging. But you certainly can oak anytime you like. If you oak during fermentation, I'd be curious to know if you like the results. Oh, and yeah, those ph strips are junk. You'll have to bite the bullet and get a PH meter. Check EBay. Thanks so much for the update! Please keep me posted. PS. I picked and crushed mine yesterday. Small crop this year due to a weird winter. I'll update soon. I am very small potatoes this year, only harvesting about 1.25 gallons from my 4 vines. The other 50 vines were planted at my parents-in-law this spring so just a few clusters from them added for fun. Also I am only getting about half the yield from my vines as I have only formed one of the cordons for my VSP training. I will form the 2nd cordon with this year's growth and theoretically doulble my 4 vines. I do expect a nice yield from the other 50 vines next year, maybe 10 gallons of must? The important thing was for me to get some practice making wine from real grapes this fall... I have only been a kit maker up to this point. So I'll be thrilled to make just 4 bottles or so from what I have. I did get to taste some Regent at a local tasting as well as a regent rondo blend... both were nice! I did press tonight even before I saw your reponse, so I am happy that the wine is now off the skins. I was shocked after work to find that it dropped massively the last 12-18 hours.... it was reading almost dry at 1.005! I hope I did not leave it too long, but I am not a picky wine taster right now anyway... so I doubt I'll notice those subtleties. I do feel as if I harvested about a week early, but I also had my eye on the rainy WA weather ahead and saw a bit of mold already so I went for it. I left one cluster on to see how much longer I could have pushed it... this is the year to learn! Sorry for the delayed reply, I've had a busy fall. I ended up doing something I usually avoid this year. Due to the unusually small crop I harvested this year, I decided to add them in with a large batch of Cabernet Sauvignon that I made with California grapes that I purchased. I usually get a 5-8 gallon batch of Regent each year, but this year I only had about 3 gal of must. So I just added the must to the 50 plus gallons of Cab Sauv must. So far it's coming along nicely. I don't think the Regent will be perceptible in the Cab. But I'm excited to find out! How is yours coming along? Thanks for posting all the info. on Regent. It's a hard variety to find much info about. How are your wines turning out? And, why do you absolutely have to press them off the skins within 5 days? Are there weird hybrid flavours? I'll be planting a few plants this Spring. Thanks! Hello. Here is a quote from the above post about the wines I've made "The wines I have made with Regent are very dark, but not inky like many hybrids. It has strong cherry notes, also common of hybrids, but a very good tannin structure. The tannins are on the medium side. My best vintages have had notes of dark fruit, earth and even chocolate. They have been really good. Under-ripe, the grape produces a herbaceous and harsher wine with more of a sour cherry component. Over-ripe, the PH can get out of control and make a flabby wine with a black olive kind of flavor." The reason for the shorter maceration times is that I find more than 3-5 days on the skins increases herbaceous, hybrid flavors. But that's my opinion and preference. Happy planting! I think it's an excellent grape especially when choices are limited due to climate. Thanks for the info. I'm very curious about this grape. I have 14 regent plants in the seattle area. First harvest last year. Love the plant, no spraying needed. Got 60 lbs of grapes in the first year. 22 brix, .6 TA, picked mid september because the bees/wasps were destroying the crop. (I net to keep birds away.) I blended with 60 lbs of pinot from Oregon in June and just tried - outstanding, velvety, rich, long finish. I have a few bottles of regent only, haven't tried yet (except at blending in June when both pinot noir and regent tasted bad.) This is a great grape, buds late but matures early. Its mid september and hope to harvest in 2 weeks if bees allow me. Steven, Thanks for stopping by and for your comment. Great to hear your wine came out so well! I'd be interested to hear how your Regent varietal has evolved now. If the blend got better, maybe the Regent has come along as well? I have yet to harvest this year. We didn't have the best summer but fall has been warm and sunny so who knows? I have mine netted as usual and I'm going to let them hang as long as I can to build sugar and phenolic ripeness. I just have to keep an eye on the PH. How are yours looking this year? I live West from Seattle near Poulsbo and planted about 100 Regent vines about 3 years ago. I had a good crop last year but the birds beat me to them. This year I am using a 10' tall "air dancer" or "dancing man" and, so far, it seems to be working. Currently Brix is near 20 but I'm hoping I can wait a bit and get it up to 22 or 23. I appreciate your reports of your experience. Thank you. Hi Tom, we are up north in Ferndale, WA with 50 vines. We could not get past 20 this year which was a disappointment! Maybe we can compare notes sometime. Hi again David. We have 10 gallons this year finishing up primary fermentation. 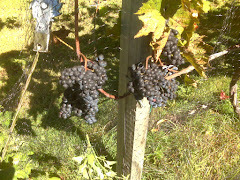 We were not able to get the brix up past 20 this year even going into the 2nd week of October. We took the fruit off just in time. Had to add quite a bit of sugar to get the brix up to 23-24. Total acids were 7.5 g/L this year and pH 3.3 . We did half with 71B-1122 and half with RC-212 so that we can have some fun comparing and contrasting the two. Here's my question. We would like to do malolactic fermentation this year to reduce TA and increase pH. What bacteria have you been using? So many to choose from! hmm yummy, thanks for sharing.. This year my Brix was 22, and then a hard rain hit, dropping Brix to 20! So had to add sugar. (Mercer island vineyards in seattle.). I net for birds, which works well. This year the raccoons! I noted an herbaceous flavor this year, which dissipated with decanting/airing. I cold soaked for 5 days before fermentation. I think that was a mistake. In 18 I will minimize skin and stem contact and see if that helps. Love this thread devoted to Regent. Subscribe to My Feed and Watch the Vines Grow! Rist Canyon Vineyards -Tons of Info for cold climate growers! Viticulture Cornell University -Great Info on Cold Hardiness etc. All pictures, photographs and content of this blog are the property of the author unless otherwise noted. Use of any material without written consent of the author is prohibited.